Starbucks isn’t the place to go for cheap coffee. It is selling an experience, not a commodity. That approach has been immensely successful, drawing in millions of customers and propelling Starbucks stock to stellar returns. But the company’s strategy has created an odd situation this summer: It has raised retail prices for much of the coffee brewed in its stores just as coffee prices on world commodities markets have fallen. Consider that once, long ago, coffeehouses were the trading centers of world financial markets. If you wanted to know the price of any commodity, you could find it while sipping coffee in London. But this year, if your only information about commodity prices came from coffee sold at Starbucks stores, you might have to conclude that a bull market was underway. The opposite is true, however. Coffee has been caught in a commodities downdraft that intensified briefly last week as China, a big commodities consumer, devalued its currency. The currencies of commodity producers like Malaysia, Indonesia, Russia, Colombia and Brazil have fallen for months now, along with oil, iron and steel. Coffee has taken one of the deepest dives. Yet on July 6, Starbucks said that its costs were rising and that it was raising the price of much of its brewed coffee by 5 to 20 cents a cup. At the Midtown Manhattan store I frequent, a “venti” cup — 20 ounces of joe — rose 10 cents to $2.55 before tax, while a “tall” 12-ounce cup stayed at $1.95. Tall cups rose in price in many other places, said Jim Olson, a spokesman. Prices for food remain unchanged. Over all, Starbucks said customer bills would increase 1 percent. It may be succeeding, though as a customer who happens to follow financial markets closely, I was startled by an apparent disconnect between world events and Starbucks decision-making. Why should I be paying more at Starbucks when coffee has been getting cheaper? The price changes in the global coffee market have been breathtaking. 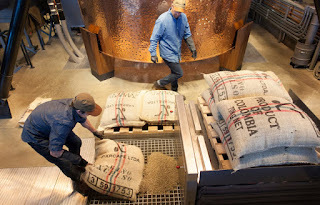 The futures price for standard Arabica, the benchmark for premium coffee, peaked in October and fell 44 percent in world markets by July 6, the day of the Starbucks announcement. Some companies responded by lowering prices. J. M. Smucker announced in late June that it was cutting supermarket prices of its Folgers and Dunkin’ Donuts brands by an average of 6 percent. Starbucks left its packaged coffee unchanged, but decided to extract more revenue in its stores. The company’s ability to raise prices has delighted the stock market. Starbucks shares have returned 5.4 percent since July 6, compared with a 1.3 percent return for the Standard & Poor’s 500-stock index. The company has outperformed over longer periods, too. Its shares returned 51 percent, including dividends, over the last year, compared with 9 percent for the index; over five years, the return was 412 percent for Starbucks versus 115 percent for the index. Starbucks has been growing rapidly and profitably, expanding while calibrating revenues and expenses. In a conference call with investors on July 23, Starbucks executives disclosed that they had already locked in the price for more than 80 percent of coffee supplies for 2016. Starbucks’s financial statements indicate that the company tries to insulate itself from exposure to currency and commodity fluctuations through hedging and advance purchase agreements. Operating costs dropped in the fiscal year that ended last Sept. 28 because of lower commodity costs, mainly for coffee, the annual report said. But when coffee prices drop unexpectedly, as they did this year, these advance strategies can have some negative short-term consequences: It’s likely that Starbucks paid more than the current spot market price for coffee stocks, which would be reflected in future financial statements. That’s one reason Starbucks is on a different timetable than the broad market. Another is that coffee accounts for less than 10 percent of Starbucks’s overall costs, Mr. Olson said. The premium Starbucks experience requires considerable spending on real estate and wages, and on extensive employee benefits, equipment, distribution and marketing, he said. And there may be another factor. Howard Schultz, Starbucks’s chief executive, told investors during the conference call last month that “mobile payments now represent 20 percent of all in-store transactions in our U.S. stores, more than double the figure from only two years ago.” I use an iPhone app to pay these days: It’s easy to transfer money without noticing the cost. Starbucks assumes that customers will consider the new prices to be reasonable, and maybe they are, if you considered past prices reasonable. In 1994, when Starbucks opened its Manhattan stores, it charged $1.25 for a small cup — then only eight ounces, known as a “short.” In inflation-adjusted dollars, that would be $2.01 today, yet a short cup in Manhattan costs only $1.85. You have to ask for one specifically, though; a short is no longer listed on store menus. Still, if you are careful, you can spend less in real money than you did in 1994, even after the latest price adjustments. Meanwhile, Starbucks is churning out profits. Even if its prices aren’t in sync with commodities markets, the stock market appreciates its timing.